Use a tripod and your camera’s timer function (if it has one). A little shakiness can really affect photo quality in low-light, long exposure photos. 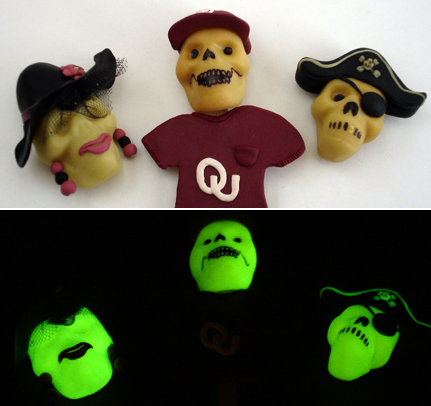 “Charge up” your glow-in-the-dark creation by keeping it in a bright place for a few minutes before the photo. This will ensure it’s glowing brightly. Find a very dark place for your photo. This is easiest to do if you can shut off all the lights except one lamp beside you. Put the object to photograph in place (preferably against a dark background such as a black posterboard), focus your camera, and get ready to press the button as soon as you turn off the light. Let me start this part by saying I'm not a photography expert. These are some of the things I've tried that seemed to give me good results. Any of you who actually know what you're talking about, feel free to correct my mistakes in the comments. If your camera has the option, increase the contrast of the image by selecting Contrast +. Change your ISO sensitivity. A larger number (such as 400) is good for shooting in dark locations. If your camera has setting selections for white balance, try the daylight setting. This is (somewhat ironically) a good setting for nighttime photos. Select a slower shutter speed. A setting of 10-15 seconds will usually work. Your camera may indicate seconds with a ” mark, as in 10” or 15”. Open the aperture wider. The aperture is indicated by F numbers (i.e., F2.8 or F5.6). The smaller the F number, the larger the lens opening. And the larger the lens opening, the more light reaches the image capturing device, resulting in a brighter image of the glowing objects. You may also be able to manually adjust your camera’s exposure by changing the EV settings. I selected +2.0EV for the brightest photo. Good luck — I'd love to see what glowing things you're creating! Tips on taking photos of glow-in-the-dark items. Thanks for the comment, Carolyn. I would love to see a pic of your glowing switchplate cover!